Architectural Digest listed its twelve most anticipated buildings for 2018 and Richmond made the list! 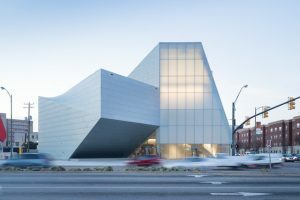 Institute for Contemporary Art, by Steven Holl Architects (Richmond, Virginia) Virginia Commonwealth University’s new Institute for Contemporary Art (ICA) is much more than what its name suggests. The genius of Steven Holl’s design is that, while the architecture is masterfully uniform, the usage of its interior is anything but that. The ICA will be used as a cafe bar, a gallery space, a 240-seat auditorium for film screenings, performances, and lectures, as well as a fabrication workshop. Not only do Holl’s irregularly shaped blocks have a whimsical feel, but they are incredibly eco-friendly as well. Four green roofs are planted with native vegetation, which are intended to absorb stormwater and increase insulation. Window and skylights have been strategically placed to ensure the interior receive plenty of natural light, reducing the need for artificial illumination. The project will be opened to the public in April 2018, roughly six years after it was first unveiled.